A few weeks ago I received a fantastic surprise in the mail! 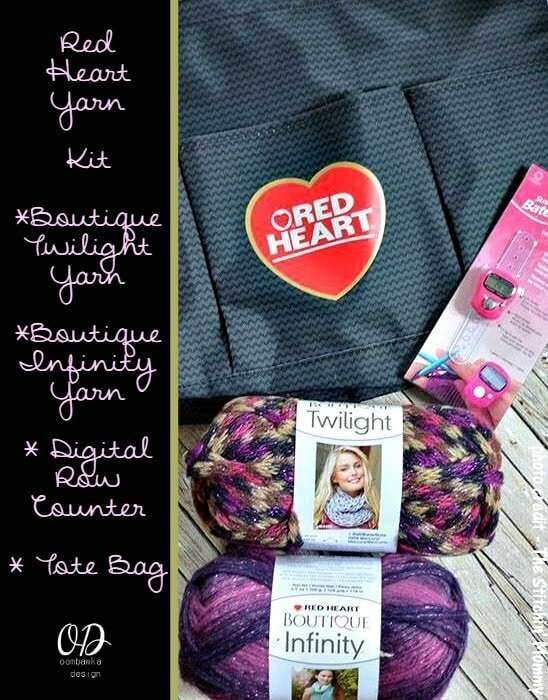 A kit including Red Heart Boutique Twilight and Red Heart Boutique Infinity Yarn, a Red Heart Tote Bag and a handy Digital Row Counter. You can read about the Red Heart Boutique Twilight Yarn and the Digital Row Counter in this post: Twilight Infinity Scarf Pattern – this is the free pattern I designed with the scrumptious Red Heart Boutique Twilight Yarn. 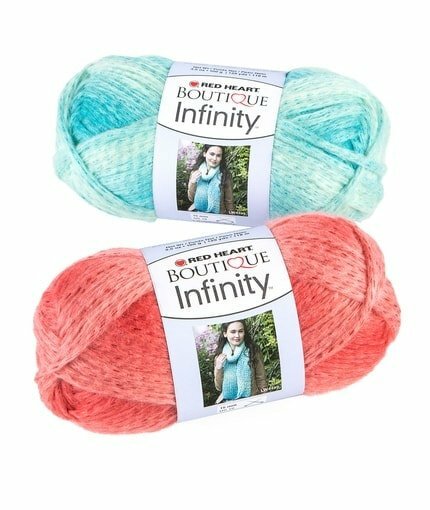 I also received one ball of Red Heart Boutique Infinity Yarn in my kit. This yarn is a super soft bulky weight yarn and when you crochet with it you will see it transition from one shade of colour to the next, creating a beautiful ombre effect. It contains a touch of metallic and is a soft acrylic and wool blend. It is beautiful to work with! The colour I received is called Enchanted. You can see all the colours on the Red Heart Website. I chose to design a free hat pattern for you to try with this yarn. 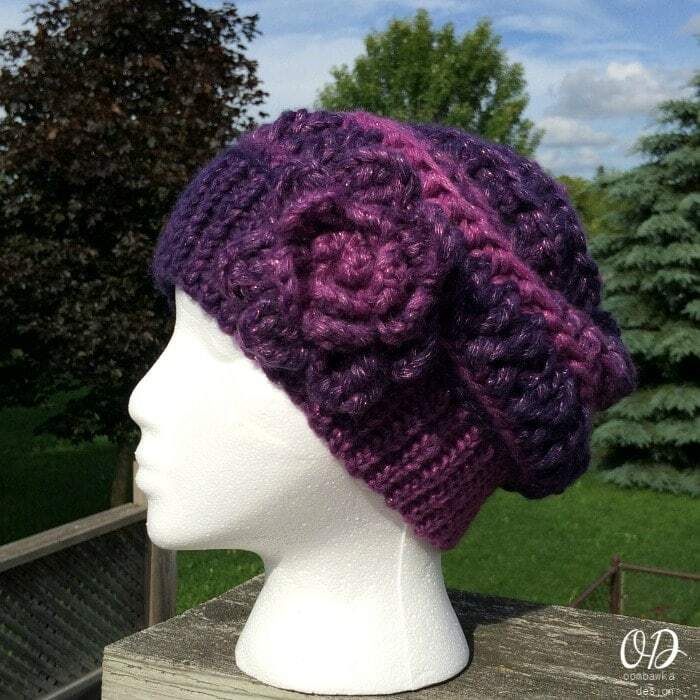 The Enchanted Infinity Slouch Hat. Part of the amazing Kit I received was permission to host a Giveaway for Red Heart! I of course said “Yes Please!” because I knew you would be happy for a chance to win a $25.00 Prize Pack supplied by Red Heart. Please note, your prize pack may not be exactly the same as mine. I hope you enjoy my 2 free patterns and please enter for your chance to win this fun prize pack below! Giveaway runs from June 23, 2015 at 12:00 am ET to June 30, 2015 at 12:15 am ET. some of them to a women’s and children’s shelter. I want to make a scarf. I will definitely try that yarn! I’ll definitely be making that cowl! I think I would make a nice scarf or hat. I’d make a cowl for sure. I would make a scarf and a blanket, at least!! Your pattern is lovely and that’s what I would make, I think. Most likely something for my mom for Christmas, hat and scarf or a shawl, my mom is petite. I would make both of your lovely patterns with this prizepack! I would make both of your lovely patterns with this prize pack! Lovely giveaway prize I would make a hat. I’d probably make a cowl or a bag. I would probably make the hat AND the cowl, a shrug, wristwarmers. I would definitely start a bag/tote! I love the free patterns!!! Thanks!!! Like the colors. Would love to see this yarn and let it tell me what to make with it. I would love to win this package and I would probably make the hat. I love the color changes in the yarn and the look of the braid. If I were to win I would make hats! I’d love to make that Twilight Infinity scarf with this yarn, it’s beautiful. Thank you for the chance to win! I think I would make my friend a infinity Cowl. Thanks for the giveaway….I think I would make a hat or a scarf. I would probably make the hat, then go and buy more to make the matching cowl and then possibly find a fingerless glove and boot cuff option to complete the ensemble! I think I would try to knit the hat pattern. Oh, I think I would need to make a cowl for my sister in PA. It has been getting very cold in the winters. I love Red Heart Infinity Yarn!!! Another great giveaway from Red Heart 🙂 Hope to win, good luck everyone. I would love to try the Red Heart Infinity Yarn Infimity scarves are one of the Christmas presents I want to make this year. I haven’t decided which yarn to use yet so trying the Red a Heart Infinity would help me decide. I would love to make a slouch hat for me, I’d need it from Autumn onwards in the cold of the English weather. Can’t wait to knit with this new to me yarn. I love Red Heart yarn. If I were to win this prize pack I would make ear warmers and a cowl. The yarn looks bulky and soft. I would make a beautiful cowl! I love to make hats–so definitely a hat! I would make the hat! I think I would make a shawl or a lapghan. Thanks for the chance to win!!!! I’d start with the wonderful hat you designed using the yarn. I’ll have to think about the other. But I’d definitely put that tote to good use. Thinking I would make a cowl, but there are many things you could do, lovvely yarn. I have an 18 month old granddaughter and two coming in July, so the options are limitless for what I could make! HaHa. Probably baby sweaters and / or booties! This is a supergreat giveaway! I love Red heart yarn, but we don’t have it in Norway. If i win i will make a Shawl or a bag. I would try and make that cute hat for my granddaughter! Thank you! I would make a scarf and hat combo. That yarn is beautiful! I would make a lacy shawl! Love this giveaway. I would make a cowl. Not sure what I would make-would have to see the yarn in person to decide and let it talk to me! so far I’ve made a couple scarves, so maybe an infinity scarf to start. Depending on the yarn in the package, I think I’d make hats to donate to the hospital. I would make a scarf and a hat with the yarn. I live the hat pattern! 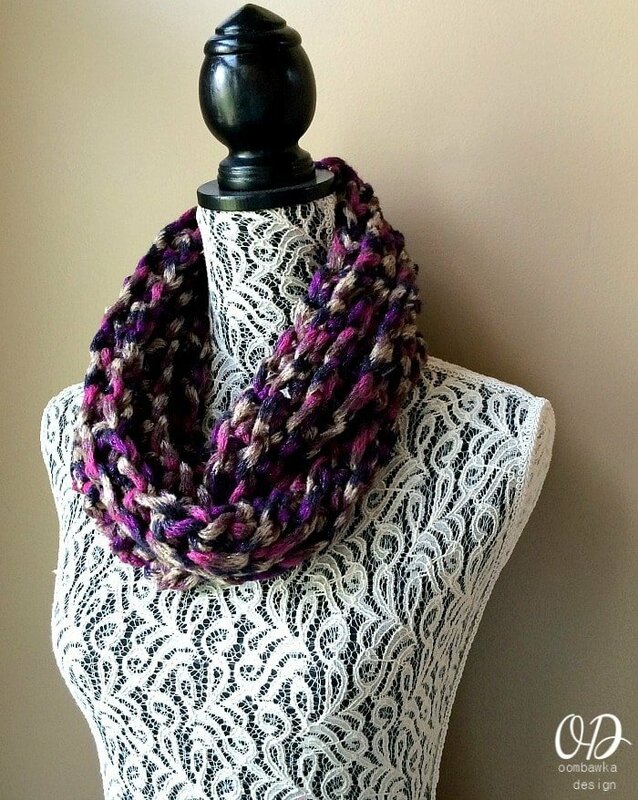 Love the Twilight Infinity Scarf….can’t wait to make it for myself (and anyone who asks for one)! I would make your Twilight Cowl. Thanks! I love cowls. That’s what I would make! Thanks for the giveaway! Got color mixed up but I do also like the enchanted yarn. I love scarves, so will no doubt make a pretty scarf if I win this lovely yarn. Love both patterns and the twilight yarn. I can’t wait to make an infinity scarf for me and my daughter! I’m new to crochet and all I have made are basic double crochet blankets. I can’t wait to try more things! I will make a cowl and a hat for my Mom. I am an avid crocheter and would love to win! I think I would make a hat or a cowl with the yarns. What a lovely Red Heart giveaway! The twilight yarn is so pretty! Am 82 years old and would really love to have the yarn, as I am always making something. I will make a hat and scarf for an early start for holiday gift giving. I will make the pictured hat. I will be making a birthday gift for my mother. I would love to make a cowl with these yarns. Both of these yarns look like they’d make scrumptious scarfs! Assuming the yarn is machine-washable, I would make a blanket for one of my favorite charities – either a pet blanket for Snuggles Project (if the yarn contains wool) or a child-size blanket for Project Linus (if the yarn is wool-free). I would make the hat! it’s lovely! I’m going to make hats if I win. Fingers crossed for this lovely prize package. If I should be the winner of this Red Heart Prize Pack, I believe I will make a cowl. Love the hat! Would love to make that!